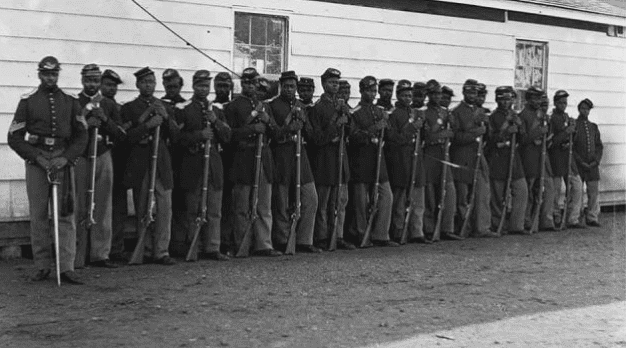 More than 186,000 African Americans served in the Union Army during the Civil War. Congress passed two acts on 17 July 1862 to prepare for the enlistment of blacks into the army – but officially, African Americans were not enlisted until after President Lincoln’s Emancipation Proclamation went into effect 1 January 1863. Photo: Company I of the 36th Colored Regiment during the Civil War. Credit: Wikimedia Commons. Not everyone waited for the Emancipation Proclamation to become official, however; several black units were established in 1862, including a prominent one from the fallen Confederate city of New Orleans, Louisiana. After a fierce fight to get past two forts downriver, Admiral David Farragut anchored his 13 remaining warships in front of New Orleans on 25 April 1862, and demanded the city’s surrender. General Benjamin Butler and his 18,000 troops were then transported past the defeated forts to the city, occupying New Orleans on 30 April 1862. Butler was strict in his administration of New Orleans and outraged many of the locals, but also worked hard to improve sanitation and instituted programs to provide relief to the poor. 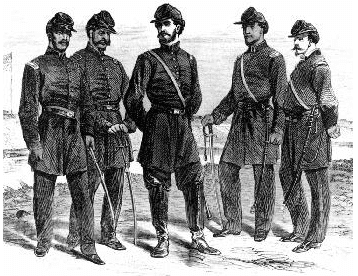 Illustration: officers of Company C of the 1st Louisiana Native Guard at Fort Macomb, Louisiana. Credit: Wikipedia. On 27 September 1862, Butler organized the 1st Louisiana Native Guard, one of the first African American regiments in the U.S. Army (it became the 73rd Regiment Infantry U.S. Colored Troops). This unit, roughly 1,000 men, was comprised of local New Orleans “free men of color,” although some of its initial troops were actually runaway slaves. A white officer, Colonel Spencer Stafford, was the regiment’s commander, and all the regiment’s commanding officers (the rank of colonel, lieutenant colonel and major) were white. However, all the regiment’s line officers (lieutenants and captains) were African American. The following letter was written by one of the regiment’s African American soldiers. As can be seen by his vocabulary and writing style, this soldier was probably one of the educated free blacks from the area, not a runaway slave. “We arrived at this place (Lafourche Landing) on the 1st instant [i.e., 1 November 1862] eight hundred to eight hundred and forty-five strong, only about thirty men having fallen out, and these from sickness. We have not, as yet, had the pleasure of exchanging shots with the enemy. But we are still anxious, as we have ever been, to show to the world that the latent courage of the African is aroused, and that, while fighting under the American flag, we can and will be a wall of fire and death to the enemies of this country, our birth place. When we enlisted we were hooted at in the streets of New Orleans as a rabble of armed plebeians and cowards. I am proud to say that if any cowardice has been exhibited since we left Camp Strong, at the Louisiana Race Course, it has been exhibited by the rebels. 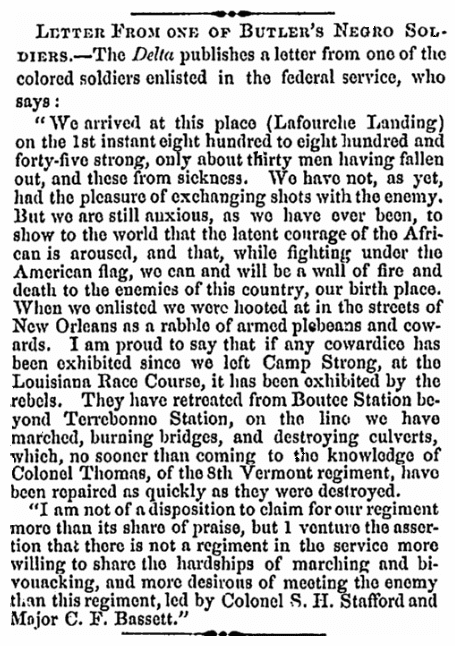 They have retreated from Boutee Station beyond Terrebonne Station, on the line we have marched, burning bridges, and destroying culverts, which, no sooner than coming to the knowledge of Colonel Thomas, of the 8th Vermont regiment, have been repaired as quickly as they were destroyed. Note: An online collection of newspapers, such as GenealogyBank’s Historical Newspaper Archives, is not only a great way to learn about the lives of your ancestors – the old newspaper articles also help you understand American history and the times your ancestors lived in, and the news they talked about and read in their local papers. Did any of your ancestors serve in the Civil War? Please share your stories with us in the comments section. I am grateful to have the opportunity to be in the presence of this magnificent letter. I am an African American lady and it gives me great pleasure to read this letter. Thank you for publishing this letter on the web site. Thank you for your kind words, Sharon. Enlightening — very much so, and I’m interested in further history of the Black Soldiers during that era. The Crater, is an historical novel which provides a graphic picture of the courage of African American soldier and their challenges. Worth consideration of issues.